With the Lord's gracious help, the first session of The Elijah Challenge Training here was very fruitful. The Lord graciously enabled us to teach the approximately 180 servants of God and disciples very effectively. Perhaps never before had we heard such uplifting comments from pastors and servants of God about the teaching afterwards. At the beginning of the demonstration of healing, a man and a woman with heart conditions (one with blocked arteries) came forward to be healed through the disciples. As hands were laid on them and their heart disease rebuked in Jesus' name, something was lifted from them and they felt very light. Both ran to the back of the sanctuary and back to the front, and felt absolutely fine. With their heart conditions, they would absolutely not have been able to do this earlier. After that people with knee problems came forward to be healed by the disciples. Some of them had had chronic knee pain and disability dating back many years---one had had the pain for twenty years. As far as I could see, all of them testified that the Lord had healed them after the disciples ministered to them. The brethren were amazed, grateful to the Lord, and greatly encouraged. Some will be bringing more infirm people to Session Two tomorrow morning. Thank you for praying and interceding for us, dear ones! The Lord is so good. In the afternoon after lunch I believe that some of the disciples went door to door healing the sick and proclaiming the kingdom of God to the lost in the homes. I will ask for their reports tomorrow. Please continue to pray for this event. May the spirit and power of Elijah come upon these disciples in double portion, resulting in significant impact upon the Great Commission in this nation. 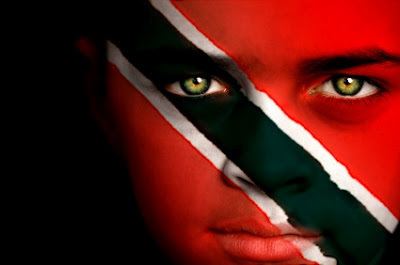 Last night we arrived in this island nation which consists primarily of the two islands of Trinidad and Tobago. (Please see the map way down below.) We were met by our hosts Dave and Rohan. Dave is a Trinidadian of Indian descent who some time ago received The Elijah Challenge Training materials from a disciple in Kansas named Pete Cabrera. Dave studied and digested the material and began to apply it. Last night he shared with us that whereas before only 1 out of 10 people were healed when he ministered to them, after studying the materials 10 out of 10 infirm people he ministered to were healed by the Lord. Dave then handed the materials to Brother Rohan, who has the ministry of a prophet. Likewise, Rohan also began to heal the sick effectively after going through the training materials---often with amazing results. Rohan is a high school mathematics teacher, and Trinidadian law and culture give him the freedom to preach the gospel and heal the sick in his classroom. Students are now healed regularly in his classes, and he estimates over the years he has led 15,000 students to Jesus Christ. Seeing the effectiveness of the Training, Dave and Rohan have invited full-time pastors and servants of God from all over Trinidad to attend the free event this week. They estimate about 200 or more will be joining us. By faith they will be providing meals for their guests over the four days of Training. Hearing what Dave and Rohan shared last night, we sense that the Lord wants to do something special here. He is pleased by the freedom accorded by the government to preach the gospel in the public schools---something forbidden in the USA. Trinidadian believers, moreover, generally fear the Lord (unlike Christians in quite a few other countries we have visited) and understand the importance of living holy lives in obedience to Him. Even the name "Trinidad" refers to the Holy Trinity in Spanish. We believe the Lord has something powerful in store for this week. Please pray that the Elijah Challenge Training this week will have great impact on the gospel in Trinidad. May He enable us to be extremely effective in training His servants to heal the sick and cast out demons as confirmation of the gospel. May powerful miraculous healings take place during the morning Training sessions and in the afternoons when the trained disciples go door to door to heal the sick and proclaim the kingdom of God. Our schedule has us conducting the Training Wednesday morning through Saturday morning from 9 AM to 1 PM. In the afternoons the trained servants of God will go from door to door to apply what they have been taught from the Scriptures. Thank you for supporting us in intercessory prayer, dear ones!